After we announced our coaching staff earlier this year, they put together a great team starting our inaugural season with the NPSL early May. 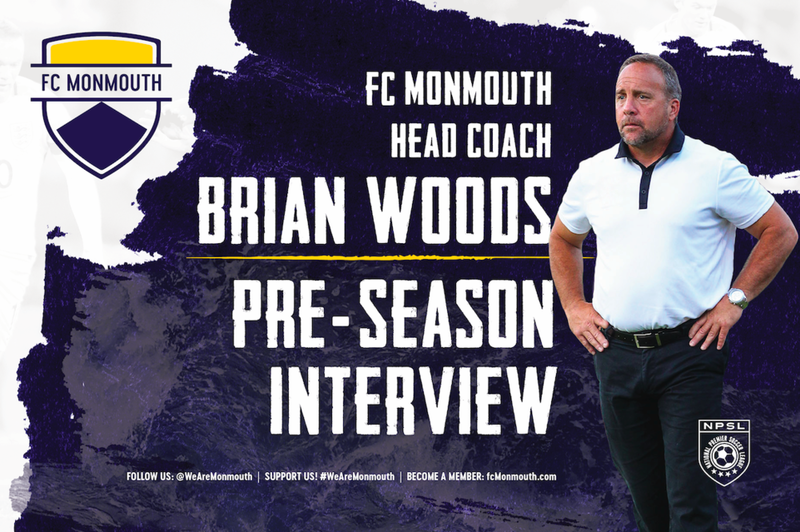 Ahead of the season we met with our Head Coach Brian Woods who gave us a little background on himself and shared his perspective on the team and the games against our NJ and PA rivals kicking off May 9th. Tell us about your background and coaching experience. I have been coaching at the college level since 1989 where I started as an Assistant Coach at my alma mater Trenton State College (The College of NJ.). After that I started coaching for Colonia FC and the NJ ODP. I then went on to be the Head Coach at my present job at William Paterson University in 1992. In 1998 I also coached the NJ Stallions women’s team in the W League, making it to the National Final Four in my first year. At the start of this century I started with a new club, Match Fit Academy, where I have worked since then as well, producing 19 players that went onto the MLS. Present day, I am the Head Coach at William Paterson University and now, proudly, the Head Coach of FC Monmouth. What does the coaching staff that you put together look like? The coaching staff for FC Monmouth I feel is a very good one to relate to the young players on their quest to move into the professional ranks. Nick LaBrocca was my first choice as an Assistant Coach and came along with me when we first met the owners. Nick played for me at Match Fit academy since the age of 15. He is young and eager to get into coaching after his very successful 10 year MLS career. His story and his struggle to get into the league and stay at this level, and then rise to be an All-Star and play against Manchester United, I think is important for the players to know and learn from. He will be an integral part of everything we do to produce a very professional environment for the team in training and matches. He is a local guy from Howell and CBA which aligns with our mission to represent Monmouth County. Peter-John Falloon is our Goalkeeper Coach and Assistant Coach for the outfield players also. He is a great personality. Players love him and his wealth of experience coaching at all levels, including Bloomfield University and currently Kean University, will be a great compliment to the staff. He was an outstanding keeper in college and will be an asset to our young keeper group. What attracted you to the opportunity with FC Monmouth? FC Monmouth presents a new challenge for me in my 30 years of coaching. I was excited about the opportunity to coach players looking to go on after their college careers are over and try to fulfill their dreams of being pros. The vision of the owners, of giving locals players a chance to prove themselves at the next level, in a great community setting at Count Basie Field in Red Bank, was one that I also embraced and that I wanted to be a part of. In turn it will also help myself and my staff to further our own coaching careers. How have things been going so far during pre-season? Things are going well I believe. We always look at things through rose colored glasses when it is new and fresh. The team is set with 25 players and the coaching staff is ready to get going. The fight for starting positions will be the next challenge. It has taken 3 months to get to this point for the coaching staff and over 2 years for the ownership group. To say we are excited would be an understatement. There will be bumps along the way but as of right now things seem to be going well. What do you think about our NPSL Keystone Conference? I expect a tough season in our division. I am familiar with most of the teams and their personnel. The group we have will be young and inexperienced playing against seasoned players. Some of the players will have international experience and come from domestic and foreign professional leagues. Our players have trained their whole lives for the opportunity to play against players like this and prove they are at that level. I expect a fight every match and the players and the coaching staff to be up for that fight. What are you looking forward the most this season? I look forward to matching wits with the coaching staffs of other teams. My staff is capable of putting together game plans that will help us get the most out of our players. I look forward to the in-game adjustments that need to be made to aid in that game plan, and supporting the growth of the players. From the first match on May 9th vs. Atlantic City FC to the last match I expect us to get better as the players become more aware of the speed of play and the level at which the game is being played at in the NPSL. What do you hope the players take away from this season? My hope is that the players come away with a sense of where they are in terms of being a professional in the sport. Also, those guys that are going back to the college ranks have a greater appreciation for what it is going to take to reach their goals as a pro and have a greater edge in their college game come the Fall. The growth of each player playing at a high level over the summer is one of the great things FC Monmouth and the NPSL can provide. What is your favorite team that you follow? My favorite team growing up was Celtic. I had the opportunity to play against Celtic Bhoys youth academy growing up a few times playing for Thistle FC in Kearney NJ. They became the team I tried to follow back then with no such thing as the internet to help with my support. Lately I am more partial to the teams my former players play on in the MLS and Manchester United. What is your favorite place in Monmouth County? I lived in Monmouth County, Freehold, for 10 years until about a year and a half ago. Downtown Freehold and Moores Tavern are 2 of my comfort spots that I have gone too for years even before I lived there. I spend a great deal of time in the Monmouth area in the summer but Freehold remains my go to spot.